Redbud Run is a small limestone spring creek located in Frederick County near the City of Winchester. The stream originates from two large springs adjacent to Interstate 81 and flows 3.7 miles until it empties into Opequon Creek. It’s a very unique spring creek in that limestone “marl” covers much of the stream bottom, which is continually changing. Redbud Run was classified as a Class III Wild Trout Stream by the Virginia Department of Game and Inland Fisheries (VDGIF) in the mid 1970’s. A naturally reproducing population of rainbow trout was first documented by VDGIF in 1975. Fish surveys in 2001 and 2005 documented a marginal, wild rainbow trout population existing throughout the entire stream. 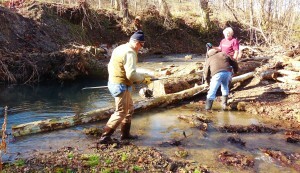 Rainbow trout stocked by private landowners is thought to be the origin of the wild rainbow stock in Redbud Run. Historically, brook trout were endemic to Redbud Run. 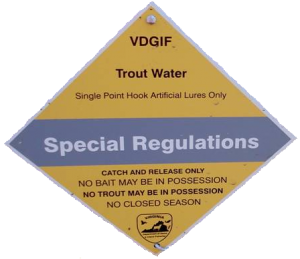 In 2003, VDGIF introduced wild brook trout into a 1/8th mile section of the headwaters of Redbud Run in an attempt to establish a self-sustaining brook trout population in that section of the stream. These wild brook trout came from the DryRiver watershed in Rockingham County. 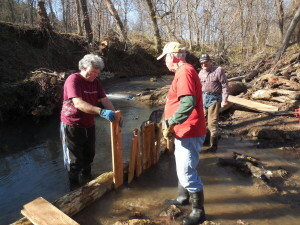 The headwater area of Redbud Run was determined to be suitable habitat for brook trout, and extremely low numbers of rainbow trout were present in this section of stream. Rainbow trout usually “out-compete” brook trout, and this has been documented in areas where rainbow trout have been introduced to existing brook trout populations. One year after stocking, an electro-fishing survey was conducted to determine if the wild brook trout had survived and spawned. Several of the adult brook trout were recaptured, but no signs of brook trout reproduction were observed. Future surveys are planned to look for signs of brook trout reproduction. In 2004, with the help of Winchester TU, the VDGIF acquired a 33-acre land parcel that includes 0.83 of a mile of Redbud Run. Planning is underway to include the VDGIF parcel in a “greenway” corridor along Redbud Run, a project in which the Winchester TU chapter is actively involved. brook trout into the waters of Redbud Run within the VDGIF portion of the stream. Although they have been slow to populate the waters of Redbud Run they have been found in small numbers through out the major portions of the stream system. Thanks to Jim Lawrence one of our Chapter members, for your convenience and in the spring of 2012 the VDGIF will open a small parking area on the east side of Woods Mill Road (Rte. 660). We urge any and all, who might choose to fish Redbud Run to please practice “Catch and Release” and to handle all fish with care and most importantly to use barbless hooks. With your help this fragile fishery will continue to exist.